Roughly 500,000 people need a feeding tube because they have trouble eating and drinking. Many times, it is hard to calculate exactly how to program the feeding pump. One example is when my sister came home from the hospital, and we were give the information to feed 3 ounces over 15-20 minutes. There are many problems with that. First of all, the unit is in ounces and to program, it needs to be in milliliters. Second of all, you can’t enter time in a feeding pump. You have to enter a rate that is in milliliters per hour. So many people need help trying to program a feeding pump. 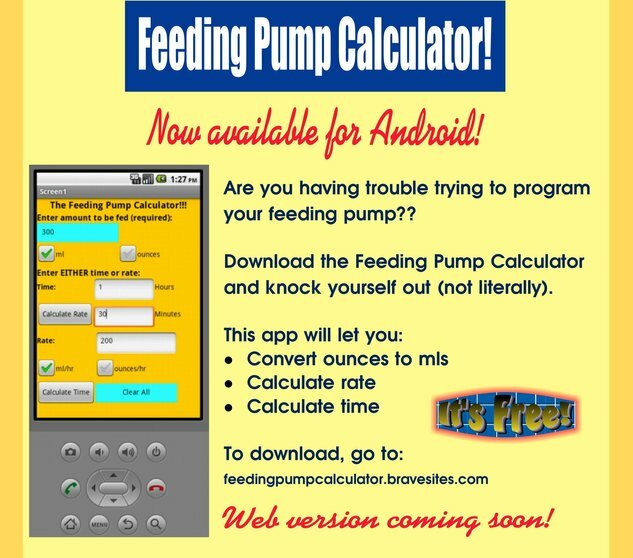 Because of this big problem, I invented an Android App that can convert units, and calculate all needed components for somebody who needs to program a feeding pump. I used App Inventor 2 and coding blocks to write this App. Go to INSTRUCTIONS for help. Go to CALCULATOR to download.